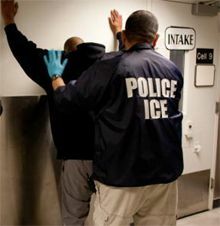 This six-day operation, the largest of its kind, involved the collaboration of more than 1,900 ICE officers and agents from all of ICE's Enforcement and Removal Operations' (ERO) 24 field offices, assistance from ICE Homeland Security Investigations as well as coordination with our federal, state and local law enforcement partners throughout the United States. Arrests occurred in all 50 states, the Commonwealth of Puerto Rico, three U.S. territories and the District of Columbia. ICE has an image problem. The Washington Post reports the agency is making changes and hopes to fix it. U.S. Immigration and Customs Enforcement will realign its duties to promote criminal investigations over immigrant deportation, officials have announced. By streamlining and renaming several offices, officials hope to highlight the agency's counterterrorism, money laundering and other complex criminal investigations and in the process "re-brand" ICE, turning the public -- and political -- spotlight away from its immigration work. Here's the memo that went out to ICE employees last week. Beyond stating ICE enforcement goals in unusually explicit terms, Chaparro laid out how the agency would pump up the numbers: by increasing detention space to hold more illegal immigrants while they await deportation proceedings; by sweeping prisons and jails to find more candidates for deportation and offering early release to those willing to go quickly; and, most controversially, with a "surge" in efforts to catch illegal immigrants whose only violation was lying on immigration or visa applications or reentering the United States after being deported. "These efforts must be sustained and will be closely monitored," Chaparro told field directors in the e-mail, which was obtained by the Center for Investigative Reporting and The Washington Post. 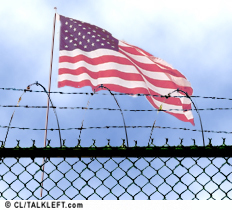 The government is obliged to treat the life-threatening medical conditions of its prisoners, including illegal immigrants who are held by Immigration and Customs Enforcement. Yet Homeland Security "has resisted efforts by the American Bar Association to turn [detention] standards into regulations, saying that rulemaking would reduce the agency's flexibility." This is the same agency that wanted the "flexibility" to fire, demote, and transfer its employees at will, without the civil service protections that safeguard against arbitrary employment decisions. The inspector general in the Department of Homeland Security recently announced a “special review” of two deaths, including that of a Korean woman at a privately run detention center in Albuquerque. Fellow detainees told a lawyer that the woman, Young Sook Kim, had pleaded for medical care for weeks, but received scant attention until her eyes yellowed and she stopped eating. Ms. Kim died of pancreatic cancer in federal custody on Sept. 11, 2005, a day after she was taken to a hospital.